CURITIBA, Brazil (AP) — The lead federal prosecutor in a massive corruption investigation roiling Brazil says that recent developments could double the size of the case, a staggering possibility given that the probe has ensnared many of the country’s elite, threatens to bring down President Michel Temer and is expanding to other Latin American countries. “I would say that the new plea agreements could allow the Car Wash operation to double its size in the future,” Dallagnol told The Associated Press on Thursday, January 26, declining to go into detail because the cases were ongoing. Dallagnol said the loss of Supreme Court Justice Teori Zavascki, who was overseeing a large part of the investigation and died in a plane crash last week, was a huge blow but ultimately would not derail the many cases in progress. He said that while many believed the investigation was creating a “new Brazil,” its long-term impact depended on whether Latin America’s largest nation took measures to reform its political and judicial systems. He likened it to an ill patient who goes to the doctor and gets a diagnosis but doesn’t act on the medical advice. “Unfortunately, we are still at the diagnostic stage,” said Dallagnol, who studied law in Brazil and then did a master’s degree at Harvard University. Dallagnol said the Car Wash investigation was succeeding thanks to a four-pronged strategy: plea bargains that lead to new revelations, operational “phases” that build on each other, close cooperation between justice and legal officials, and a transparent communication strategy that includes divulging details of cases once arrests are made. 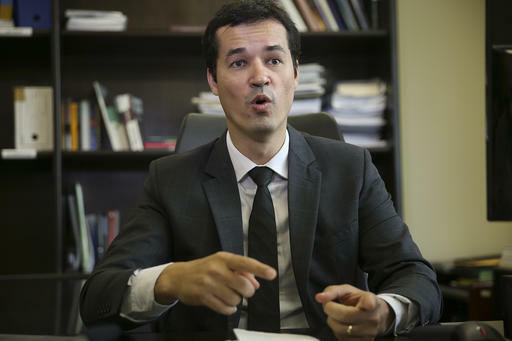 Dallagnol also praised Moro, the judge, saying his vast knowledge of laws related to corruption and ability to succinctly apply the law were key factors. To many Brazilians, fed up with corruption and their political leaders, Moro and Dallagnol are heroes, a designation that Dallagnol flatly rejects. “We are just doing our jobs,” he said. The investigation has become so large that it is expanding to other states and judges. The arrest warrant issued Thursday in Rio for Eike Batista, previously one of the world’s richest men now wanted for allegedly making bribes, is a testament to how far the Car Wash investigation and its offshoots have gone. Last year, prosecutors reached a plea agreement with dozens of executives of constructor Odebrecht. The agreements, expected to be made public early this year, are believed to have damning evidence of bribes against top politicians in Brazil and possibly in other Latin American countries, including Argentina, Peru and Venezuela. Dallagnol brushed off criticism of the tactics used during the investigation, which have included building cases based in part on plea bargains, wire taps and making accusatory statements about defendants who have not been convicted. Supporters of Silva and his Workers’ Party immediately accused Dallagnol of playing politics since Silva had yet to even stand trial. Silva, president between 2003 and 2010, has expressed interest in running for the presidency in 2018 and leads in preference polls. Dallagnol defended the designation, saying it was based on all the cases against Silva, not just the charges being presented that day. Dallagnol noted that only two of the five cases against Silva are in his jurisdiction. Tags: brazil, CarWash, Curitiba, DeltanDallagnol. Bookmark the permalink.